It is a old fashion, small town motel. It is clean and the management makes sure to remember you and make it memorable. This is a family owned and operated motel. Our motto is "Our family welcomes your family". Our guest rooms offer affordable, clean, and care-free stays. 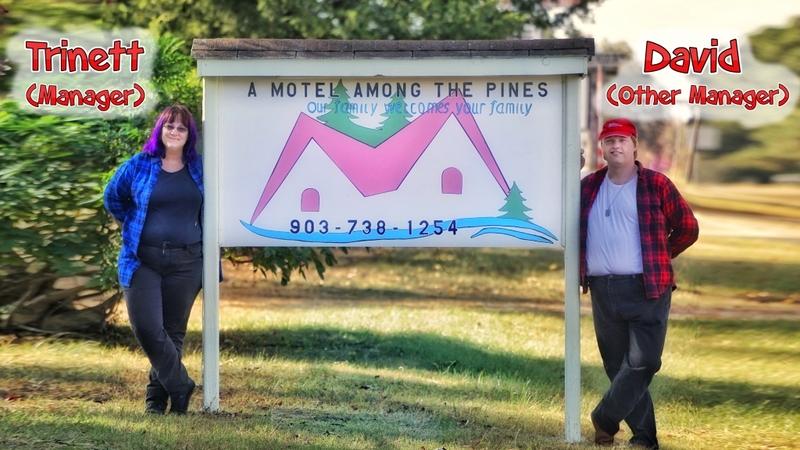 At A Motel Among the Pines, we provide you with everything you need to enjoy your time here. Guest rooms come equipped with individually controlled air conditioning and heating, linens for beds and bathroom, new flat screen television (with local channels only), individual bathroom facilities. Each room has a coffeemaker, complimentary coffee with Styrofoam and plastic cups. We have 6 outdoor charcoal grills and each room has two outdoor chairs to relax in. We also offer exterior outlet plugs for boat hookups. Guests can also enjoy a day of lying poolside during the warmer months. Pet Friendly. Single Queen rooms have one queen bed, 2 guest maximum. Single King rooms have one king bed, 2 guest maximum. Doubles rooms have two full beds, 4 guest maximum. Our website offers more information, photos, and the ability to make reservations from your phone or computer, or if you like that personal touch just call.